Electronics Valley (99.7% positive feedback, Top Rated Plus Seller) via eBay Daily Deals offers Apple’s 15-inch Retina MacBook Pro 2.2GHz/16GB/256GB (model MJLQ2LL/A) for $1,599.99 shipped. That’s 20% off the regular price, a match of our previous mention and the best available. It’s important to note that we’re expecting fresh Retina MacBook Pros within the next few weeks. 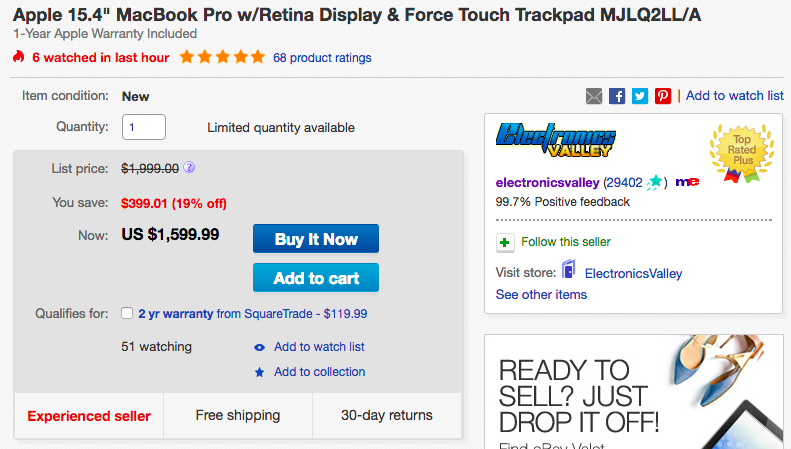 But if you’re looking for deep savings on a new MacBook, this is a solid option. Apple’s powerful MacBook features a 2.2GHz Intel Core i7 processor, 16GB of RAM and 256GB of PCIe-based Flash Storage. You can expect around nine hours of battery life on a single charge. The 15.4″ MacBook Pro Laptop Computer with Retina Display & Force Touch Trackpad from Apple is a powerful notebook computer with an innovative, ultrathin, ultraportable aluminum unibody design. It is loaded with advanced power management features and an integrated lithium polymer battery, which work together to provide up to 9 hours of wireless web browsing. The widescreen, LED-backlit IPS screen has a glossy finish and a native resolution of 2880 x 1800. With 220 pixels per inch, this MacBook Pro has a pixel count of over 5 million.